There’s a new category of climate and environmental champions appearing just as the federal government is fading into the background: corporations. While we’ve been conditioned to think of corporate sustainability programs as greenwashing, evidence of real action is mounting, motivated by consumer and investor demand, and real threats to and opportunities for businesses. I know this because I’ve been working inside the belly of a corporate beast for eight years now as its environmental sustainability officer. My company is in the “Internet cloud” space, developing software-based services that are accessed via the cloud (public Internet). Our customers are the world’s Global 1000 companies as well as young startups, spanning all industries. Electricity consumption, the associated carbon emissions, and electronic “waste” from the annual decommissioning of thousands of servers are our main environmental impacts, similar to many other companies providing Cloud-based services, like Google, Microsoft, and Amazon. 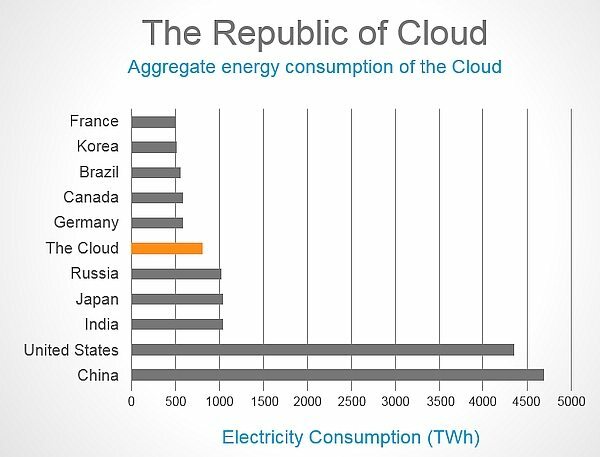 To put things into perspective, if the Cloud were a country, it would rank 6th between Russia and Germany in global electricity consumption, as illustrated in the graph to the left. It’s one of the fastest growing industries, surpassing the airline industry in terms of energy consumption and carbon emissions. My company’s globally-distributed network alone annually consumes the equivalent of 25,000 U.S. households in electricity. On the bright side, the Internet has and continues to replace more energy-intensive and material-intensive activities. It enables us to read, shop, listen to music, bank, work and socialize with less material consumption and without getting into our cars. In fact, a study by McKinsey & Company found that the efficiency gains from the Internet far exceed its impacts. Nonetheless, in the face of climate change and dwindling natural resources, it’s important that all industries and companies reduce their environmental impacts. Justifying resources to work on reducing our global network’s energy consumption is fairly straightforward because there’s a compelling cost savings. We’ve been quite successful, effectively decoupling our electricity consumption from our business growth. 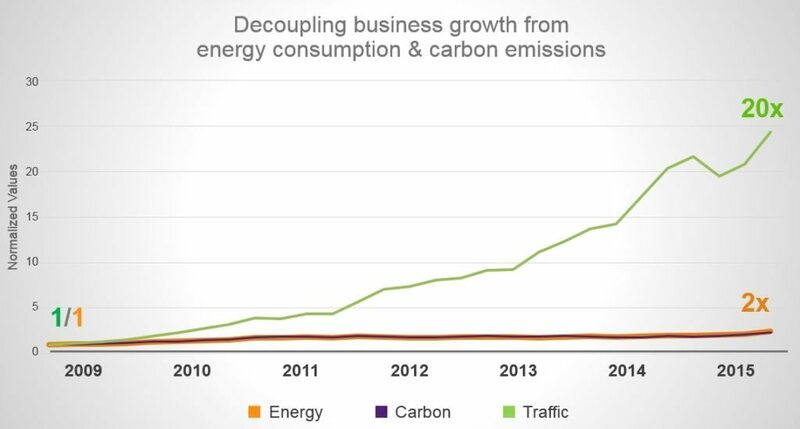 Energy, carbon and network traffic data, collected since January 2009, show that in the past seven years, while the traffic on our network has grown twenty-fold, our energy and associated carbon emissions have only doubled, saving millions of dollars in the process. We’ve achieved this through more efficient and powerful server hardware, and more productive software. But no matter how efficient we are the network will always require electricity, so the next step in our sustainability journey is to decarbonize that energy. But how to justify the resources required? As we all know, Wall Street won’t accept merely that “it’s the right thing to do”. Last year I convinced our executive management and board of directors to adopt a greenhouse gas (GHG) reduction and renewable energy goal. By 2020, we will reduce our GHG emissions below 2015 levels by sourcing renewable energy for 50% of our global networks operations. It was not an easy sell. After all, consider this from their perspective: we aren’t required by law to reduce our GHG emissions; renewable energy is not a critical aspect of our operations; it may be difficult to procure and we have other more important priorities. My strategy was to get them to see a clean-powered network as a feature of our services that our customers value. That’s what management and investors understand: product features, customer demand, and competitive differentiation. What sealed the deal was that over the previous few years the number of customers setting 100% renewable energy goals grew significantly, representing more than 25% of our revenue. The trend was clear. Decarbonizing operations is something that a large and important fraction of our customers care about and would value in a supplier. That’s something executive management could rally around while keeping investors happy. It also points out that we, as activists, can play a role in demanding that the products we buy are decarbonized as well, thereby exerting our influence on the business world. This then, is a success story. But renewable energy and carbon reduction are only two dimensions of our operational impacts that we are addressing. For example, how do we get to a point where instead of becoming electronic waste, our servers are entirely reusable? How can we eliminate the use of water for cooling in our data centers? How do we negate the carbon emissions from our employees’ air miles? What is the value to the business and to our investors of doing these things? The vast majority of companies are for-profit, driven to maximize profit and return-on-investment from their shareholders. Therefore, as with all corporate initiatives, whether developing new product features, hiring more accountants, or expanding office space, there must be a justification for the expenditure and resources. Understanding the business value of sustainability is itself a fairly recent innovation, and like any innovation it has phases of adoption, as shown below. Innovator and early adopter leaders recognize the opportunities for their businesses whether it’s creating new products, expanding into new markets, beating competition, or reducing costs or risks. Often innovation happens in response to changing markets conditions. The companies that excel at innovation are the ones that anticipate and take advantage of the change. The rise of the Internet, mobile phones, and the shared-economy—where goods and services are shared not owned, like AirBnB and Zipcar—are examples of changing market conditions giving rise to online shopping, entertainment, news and ride-sharing, with the likes of Amazon, iTunes, Netflix, Shutterfly, and Lyft challenging the late majority, conventional brick and mortar businesses that are slow to adapt: newspapers, music, landline phones, and taxi businesses, for example. A growing number of companies are recognizing and responding to the threat of climate change and the wide range of changing market conditions that it represents. Many are signing up to power their operations with 100% renewable energy, driven by a range of motivations including a low, fixed cost of electricity, market and regulatory uncertainty, and demand from customers and investors. While cost savings and risk mitigation are valid justifications for taking action, it’s competitive differentiation and product innovation that drives top line revenue and is the most compelling justification for executive management. Patagonia, Unilever, Etsy, and others have demonstrated that incorporating sustainability into their business strategy can lead to greater profitability. A recent study shows that sustainable goods represents a $1 trillion market opportunity. Both Unilever’s and GE’s sustainability-focused product lines represent the fastest growing segment of their businesses by a large margin. Patagonia has reinvented how it makes its high-performance sportswear that’s more durable, using less water, materials and energy, even encouraging customers to repair rather than discard worn clothing. Patagonia’s actions have been good for both the environment and its bottom line, and are setting a fast pace for its competitors. Even Walmart (yes, I dare to mention the “W” word) has realized the business value in reducing its environmental impact. It’s one of the largest companies in the world (if it were a country it would be the 20th largest) with one of the largest supply chains. When Walmart pressures its suppliers to reduce their energy, carbon, water and packaging footprints it has an enormous ripple effect felt, literally, around the globe. Former CEO, Lee Scott, launched Walmart’s sustainability program in 2005 after he “saw the light” when an employee, in the aftermath of Hurricane Katrina, opened a local store supplying survivors with much needed clothing and food, well in advance of state and federal agencies, without first getting approval from “corporate”. Lee was moved and had an epiphany: “What if we used our size and resources to make this country and this earth an even better place for all of us: customers, associates, our children and generations unborn?” He committed Walmart to (1) use 100% renewable energy for its offices and stores, (2) create zero waste, and (3) sell products that sustain our resources and environment. It might well be that companies are the ones that will thwart Trump’s plans to pull out of the Paris Climate Accord. And for those companies that are reluctant to “do the right thing”, investors are bringing pressure to bear. Large investor groups, both mainstream and activist investors, are realizing that companies that are acknowledging and managing the risks and opportunities associated with climate change are a better investment than those that do not. They are pressing companies to be transparent about how they are managing these risks and opportunities, which, in turn, is forcing even the late majority to take action. Research has shown that the stocks of companies’ that are best at actively managing environmental, social and governance aspects, outperform those that are the worst by 18 percentage points. New organizations like the Task Force on Climate-related Financial Disclosures are shining a spotlight on companies, pressuring them to provide full disclosure regarding climate-related financial risk for use by investors, lenders, insurers and other stakeholders. And we all know that what gets measured (and disclosed) gets managed. Even more encouraging than individual corporate successes and forward-thinking investors are the entire new industries that are springing up to accelerate innovative solutions that will help to address climate change, such as electric and self-driving vehicles (Tesla), renewable energy, reusable fashion, biofuels (LanzaTech), and insect-based foods (All Things Bugs). While we are often dismayed and discouraged by the damage that our free-market, for-profit companies wreak on the environment, when those same companies are redirected to mitigate, heal, and perhaps reverse the damage, the results can be swift and powerful because they are profit-driven. We as the activist consumers can play a key role in accelerating corporate adoption of sustainable practices. We can be a powerful voice, helping to provide the business case by voting with our pocketbooks and letting companies know what we like or don’t like about their products and/or how they are operating their businesses. No company is perfect but we can reward those that are proactive in leading the way to a sustainable future, and help to expose, pressure and divest from the ones that aren’t. Nicola Peill-Moelter is a member of SanDiego350, a grassroots climate change action organization. She has a Ph.D. in environmental engineering science from Caltech, a B.E. in chemical engineering from Manhattan College and serves as the sustainability officer at a Fortune 500 company. Nicola lives in Poway with her husband, Eric, where they strive to minimize their environmental footprint. She has come to realize that action on climate change needs to happen on a major scale through collective action at the personal, community, corporate and governmental levels. « These 156 Lawmakers Support Expanding, Not Cutting, Social Security. Does Yours? There is a lot of bad news out there regarding corporations and much of it is well deserved, but there is reason for optimism as well. Thanks to Nicole for pointing that out. Excellent article and my own corporate experience backs up every premise presented here. While working at a large local biotech company, our EHS/Corporate Sustainability efforts led to a complete re-engineering of the bio products to eliminate dry ice cooling for shipping as well as reduce or eliminate need for styrofoam packaging. It became a huge product feature to our scientific customer base, many of whom value sustainability highly. Let’s hope all corporations share the vision! Thank you for the optimistic perspective on what forward thinking corporations can accomplish. We certainly can’t depend on our government to respond with any urgency because they have proven repeatedly that they lack the will. Another component of action on climate change is personal action. We all need to be walking the talk. Solar on our roofs is a good place to start. And now that affordable EVs are showing up in the automobile market we have another opportunity to take personal action against climate change. We still need government (federal, state and local) to do their part. Citizen activism is one of the most powerful thing individuals can do, making our voices heard by our elected officials regarding policies that will address climate change: implementing community choice aggregation, better fuel economy standards, agricultural practices to enhance soil health (absorbs CO2 and retains nitrogen), improved public transit to reduce emissions, continued support for rooftop solar and renewables in general, incentives for energy efficiency, etc. You can voice your concerns and desires through phone calls to and meetings with elected officials, letters to the editor, petitions, rallies. Come out to the March for Science April 15 10am at the Civic Center and the People’s Climate March April 29 10am at Waterfront Park San Diego. It is good to hear about companies adopting clean energy strategies! If all fortune 500 companies just executed clean energy strategies for the cost savings, it would have a huge environmental impact. Thanks for the great article. In fact most of the Fortune 500 and Global 500 companies have renewable energy goals. Check out re100.org.